Carrick-on-Suir sprinter Sam Bennett recorded three stage wins at the Giro d'Italia. IRISH RIDER SAM Bennett has followed up a brilliant display at the Giro d’Italia by winning the Rund um Köln in Germany on Sunday. Bennett claimed three stage wins in Italy throughout the month of May and has replicated that form by winning the second-oldest race in German cycling, beating off competition from former Tour de France champions. 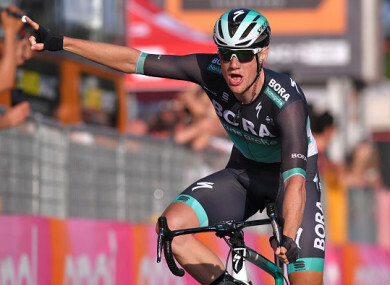 The Bora-Hansgroha rider was first to the line in Köln and succeeded in recording his fourth victory of the current UCI campaign. Sunday’s win — a 207km race throughout the city involving 143 riders — marks another massive boost in the 27-year-old’s rapid development, as he saw off competition from riders like Szymon Sajnok and Mihkel Raim in the bunch sprint with a time of 4:53:17. The Carrick-on-Suir man won three stages during the 2018 Tour of Italy, including a dramatic sprint finish during the 21st and final stage in which he pipped four-time winner Elia Viviani. Email “Success continues for Sam Bennett as Irish rider records Rund um Köln win in Germany”. Feedback on “Success continues for Sam Bennett as Irish rider records Rund um Köln win in Germany”.